Why Use Tape? -- What exactly does it do? What To Look For In Tape -- What makes a tape good or bad when taping an injury? Keep reading to find out how tape can help aid your injury and prevent further tissue damage. Whether you have a tear, strain, sprain or chronic condition, there is a tape application out there that can provide the affected area with extra support and protection. Not sure what you’re looking for when shopping for tape? We have advice on what kinds of materials and styles to look for, and which ones you should avoid. We also have information on how to prepare the area for taping and how to customize the application to your specific injury or condition. Want to make your tape application as effective as possible? Read our Taping Tips to find out. Not sure when you’re supposed to wear the tape? It’s easy -- tape is designed to be worn any time, but is particularly important during physical activity. Read on to find out more! Athletic tape (also known as sports tape or kinesiology tape) is steadily increasing in popularity with medical practitioners, physical therapists, trainers and coaches. It's designed to provide support and protection for your tissue in order to help prevent re-injury. This is especially important when you're being physically active. Many amateur and professional athletes wear athletic tape when they train and compete, with some claiming that it helps to improve their movement. However, athletic tape isn't designed for athletes alone. Anyone can use it to target specific muscles, tendons and ligaments that may be painful, strained or injured. Many people who use athletic tape find that it feels great when applied over trouble areas and even provides joint stability. It sticks to the skin but doesn't restrict your movement or get in the way of your daily activities. 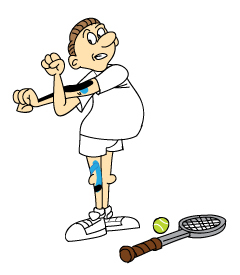 If applied correctly, athletic tape can also help to relieve inflammation. Athletic tape is designed to be as lightweight and breathable as possible, while still being stretchy enough to do the job. It's used on a number of different injuries and conditions, including Shin Splints, Achilles Tendonitis, Rotator Cuff injuries, Tennis Elbow, Meniscus injuries, Carpal Tunnel Syndrome, Plantar Fasciitis, and many more. You should look for a tape that's made with a medical adhesive, and is hypoallergenic and latex-free, as this will ensure as little irritation as possible, which is especially important for people with sensitive skin or allergies. Ensure that the tape is made with medical grade materials. 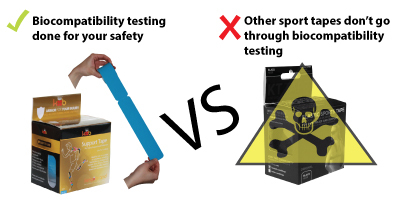 Most tapes on the market ARE NOT made with high quality materials, because there are no safety standards on athletic tape. Be cautious of big brand tapes, as they have likely been manufactured with toxic materials that haven't been tested. Don't be fooled by the brand name. Companies that manufacture with low quality, toxic materials don't care about your safety. Just because the tape is being sold in a pharmacy doesn't mean that it's designed to be safe. If the tape has been screen printed with a fancy design, beware, as many screen printing inks contain toxic chemicals. You need to find a tape that's been tested and certified as being hospital grade and is biocompatible. This is important because the tape is coming into direct contact with your skin, and you want to make sure you choose something that is as safe as possible. You also want a tape that's got a lot of stretch, so it can get the job done. Another thing to pay attention to is how long the tape will last and whether it's waterproof or not. A good quality tape will be both thin and comfortable yet strong and sturdy. Athletic tape generally comes in both Pre-Cut Strips and a Continuous Roll variety. Both Pre-Cut Strips and Continuous Rolls have their advantages. If you're looking for something quick and easy, the Pre-Cut style has already been cut into ready-to-use strips for you, so you can apply it and go. Since it requires almost no cutting, you can just throw it in your gym bag and apply it later. If you're looking for a tape that allows for a lot of customization, the Continuous Rolls of tape are ideal, as they provide the most options in terms of cutting the tape into different shapes and sizes. This means you can create an application for your injury that's specific to your size and shape. There are several steps you need to take before you apply the tape to your skin. First, clean any oil, dirt or lotions from the application area and dry off your skin. You may also want to consider removing any excess hair from the application area, as it may be pulled out and cause pain upon removing the tape. 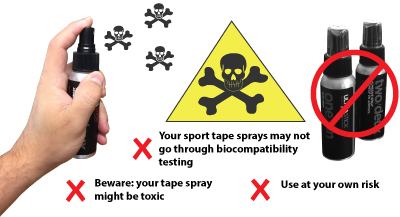 DO NOT use taping sprays that claim to help the tape stay in place. Many of these sprays contain highly toxic chemicals, including carcinogens. Tape sprays are NOT safe. Just read the ingredient lists on tape sprays and you'll understand why. Many of them contain harmful ingredients such as Butane, Acetone, Heptane, Isopropanol, Propane and Resin. You DO NOT want to breathe in these toxic chemicals or have them applied directly to your skin. The internet is full of various application instructions for almost every soft tissue injury, ailment and condition out there. For example, YouTube may have 10 or more different application videos for a given injury. It's important to experiment with different applications for your specific injury so you can find the one that works best for you. Customize the application to what you are feeling - everyone is different and your experience may differ from someone else with the same injury. Apply the tape where you feel you should apply it, based on where you feel the pain or tightness or whatever symptom you're treating. Trust the pain and use it as a guide when applying the tape. 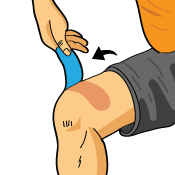 Also, the more Tape you apply the more support you're going to provide to the injured area, so be sure to apply a double layer prior to physical activity. 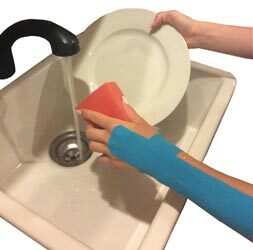 *Remember, taping methods for a given injury or condition will vary, as the point of pain won't be the same for every person. Just remember to tape your injury based on where you feel the pain. Don't remove the tape backing all at once - tear off small pieces and remove it as you go. The tape itself stretches, but the backing doesn't. This allows you to tear the tape so the backing comes off in small pieces, without damaging the tape. This makes the application process much easier. Make sure you rub the tape into the skin as you apply it. This will ensure that the tape is sticking to your skin properly. When you're removing the tape, be gentle. Try not to rip hair out or cause pain. Use water or baby oil when removing the tape, as this can help it come loose more easily. Since it's small and portable, it's also easy to travel with. You can pack it in your gym bag, purse, suitcase or backpack and take it with you wherever you go. Re-injury doesn't just take place during rigorous physical activity - it can take place when doing even the smallest of movements. Wear the tape all day long to provide your injury with protection and support, and to help prevent the risk of re-injury. For most people who use Kinesiology Tape, they use it with no negative side effects. One of the most common side effects is temporary redness when removing the tape. This is because the adhesive that helps the tape stick, may cause a temporary redness that will go away in a half hour. You may also notice the adhesive pattern on your skin as well. This is nothing to worry about, as it's temporary. To reduce the redness when removing the tape, removing it in the shower will help with the temporary irritation. If you have a sensitive skin, you may use kinesiology tape, but it may irritate your skin. 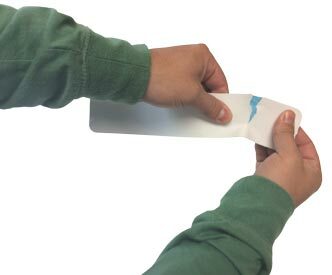 Applying a small test strip of tape can help ensure that your skin can tolerate the adhesives in the tape. If you have thin skin due to aging, inury, or as a side effect of medication use, you may wish to apply a small test strip to ensure your skin can tolerate the adhesive properties from the tape and not cause any skin breakdown. The tape can be applied as often as needed. When applied it can last for about 2 days. Once it is removed, it is disposed of and cannot be reapplied. Each roll comes with about 200" of tape. This will last the average person about 15-20 applications depending on the area.